After a coffee break in Deauville (?) 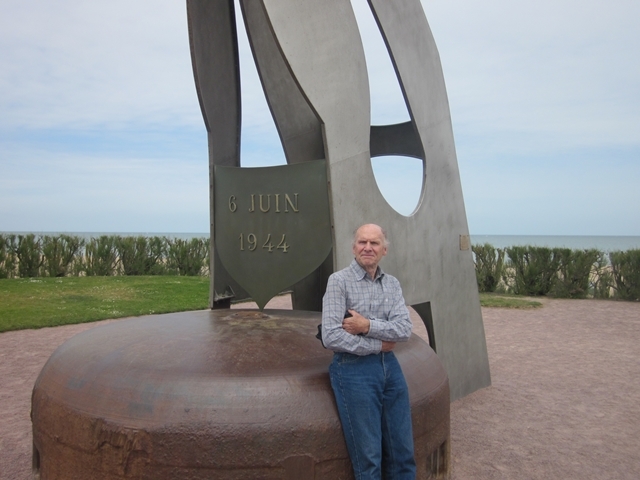 we drove to the area in Normandy that was the focus of the Allied Invasion on June 6th 1944.. The war in Europe had been ongoing since 1939 when the German Armies under Adoiph Hitler’s order invaded Poland. The Americans were late in coming to the war. North Africa was an Allied battlefield in 1943 and Italy in 1943, but this was the first invasion of “mainland” Europe. Much of the French Coast was the fortified “Atlantic Wall” that was Hitler’s defense of a Europe dominated by the German military and the Nazi government. Numerous books and even movies have describe WWII. I can’t hope to improve upon them. 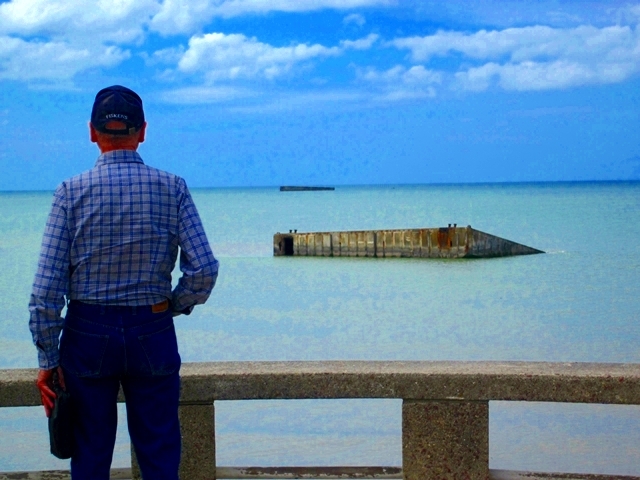 I can give a personal view of D-Day as seen by Archie and I. 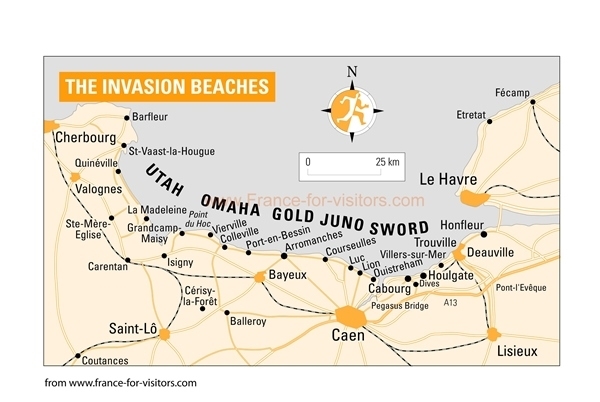 Here is a generalized view of the D-Day beaches. Here is a reproduction of the bridge as it sits near the Pegasus Museum today. In 1944 it was renamed Pegasus Bridge in honor of the operation. The name is derived from the shoulder emblem worn by the British airborne forces, which is the flying horse Pegasus. 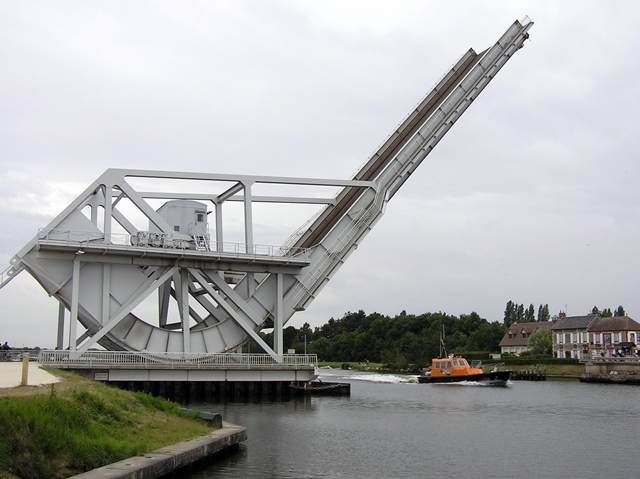 Pegasus Bridge is a bascule bridge (a type of movable bridge), built in 1934, that crossed the Caen Canal, between Caen and Ouistreham, in Normandy, France. 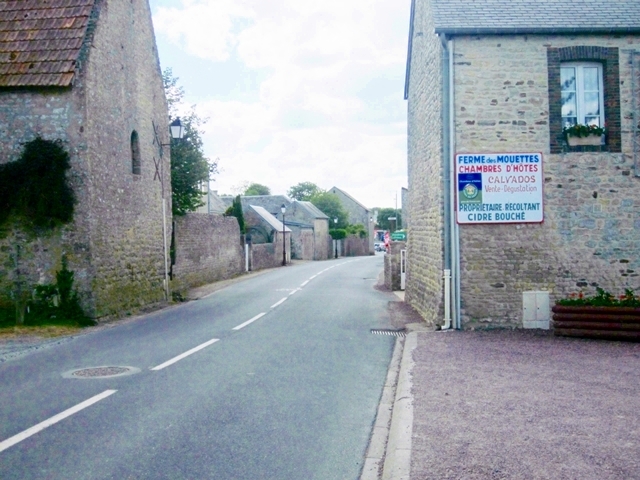 it was, with the nearby Ranville Bridge over the river Orne, a major objective of Operation Deadstick, part of Operation Tonga in the opening minutes of the invasion of Normandy. A glider borne unit of the British 6th Airborne Division, commanded by Major John Howard, was to land, take the bridges intact and hold them until relieved. 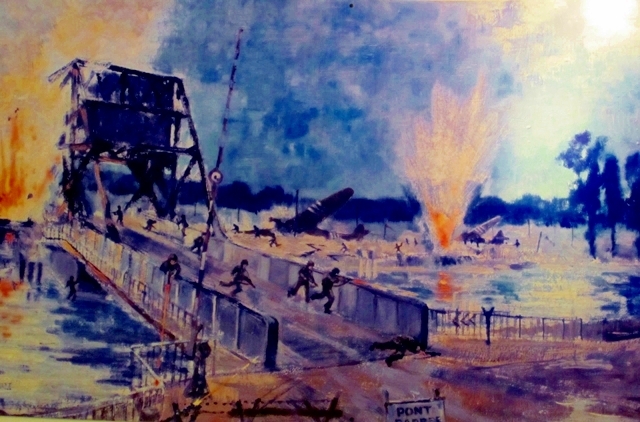 The successful taking of the bridges played an important role in limiting the effectiveness of a German counter-attack in the days and weeks following the invasion. 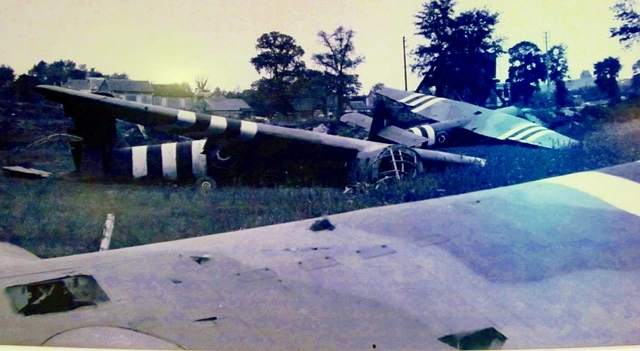 Here are some of the gliders that carried the British 6th Airborne Division. This is an artists rendering of the battle for the bridge. 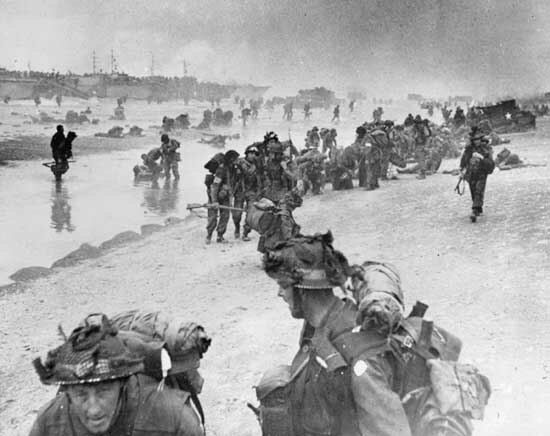 This battle was crucial because it was on the eastern-most end of the Invasion beaches and prevented a German flanking counter attack on those D-Day beaches. After the Pegasus Bridge we moved on to the Sword Beach. Today it is a sea-side resort area with a broad, flat, sandy beach. 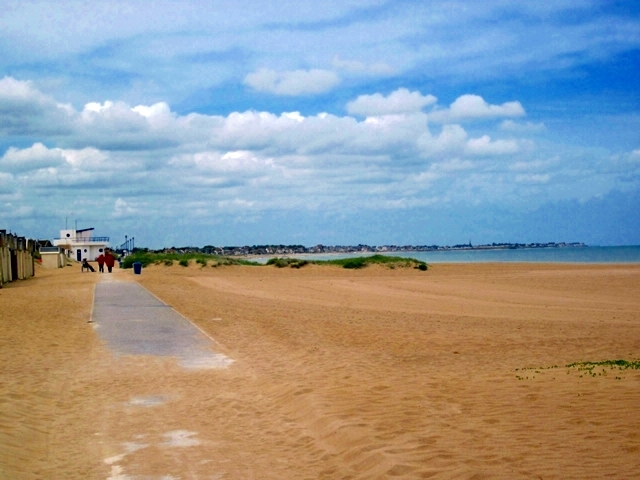 Sword Beach, the easternmost beach of the five landing areas of the Normandy Invasion of World War II. It was assaulted on June 6, 1944 (D-Day of the invasion), by units of the British 3rd Division, with French and British commandos attached. (Above.) Shortly after midnight on D-Day morning, elements of the 6th Airborne Division, in a daring glider-borne assault, seized bridges inland from the beach and also silenced artillery pieces that threatened the seaborne landing forces. The Germans had fortified the area with relatively light defenses consisting of beach obstacles and fortified emplacements in the sand dunes. A few miles inland from the beach were 88-mm guns capable of supporting the machine guns and mortars that were placed in the dunes and villas and that constituted the Germans’ first line of defense. There were also antitank ditches and mines as well as huge concrete walls blocking the streets of the towns of Lion-sur-Mer on the west to the city of Ouistreham,on the east. 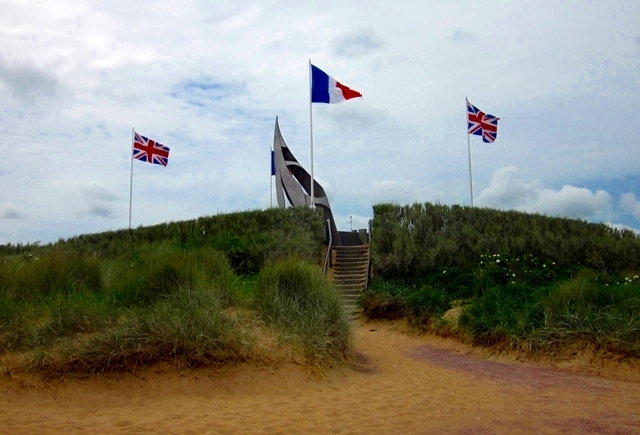 The British, French, and Canadian (I think) monument at Ouistreham on Sword beach. 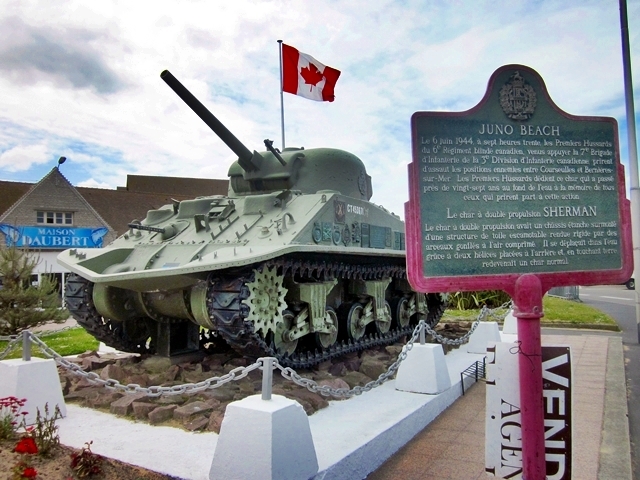 Let’s move west to Juno Beach. 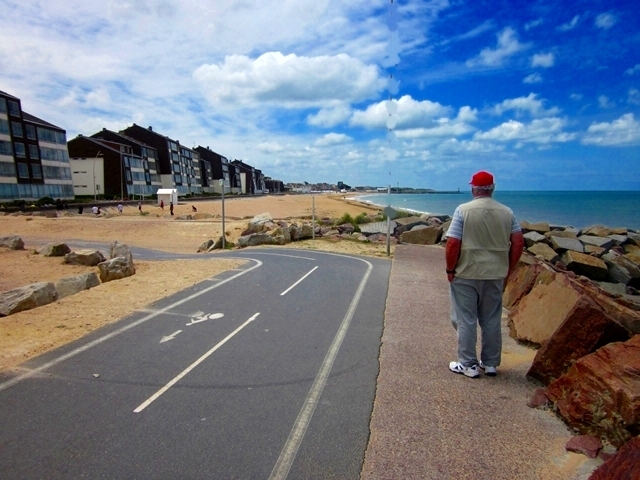 Today it is the sleepy sea side resort village of Courseulles-sur-Mer. 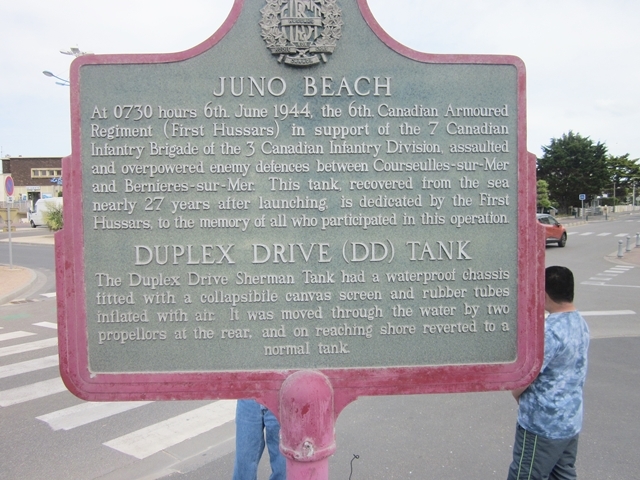 This is one of the Amphibious Tanks that the Canadians used on Juno Beach. This tank was recovered in 1970 in the sea, it was restored before being exposed. Badges of units who fought in the area are welded to it. A plaque is dedicated to Leo Gariepy who fought there in his tank. This is a German observation tower on Juno Beach that has been restored. We moved on to Gold Beach and the town of Arronmanches les-Bains which is today mainly a tourist town. 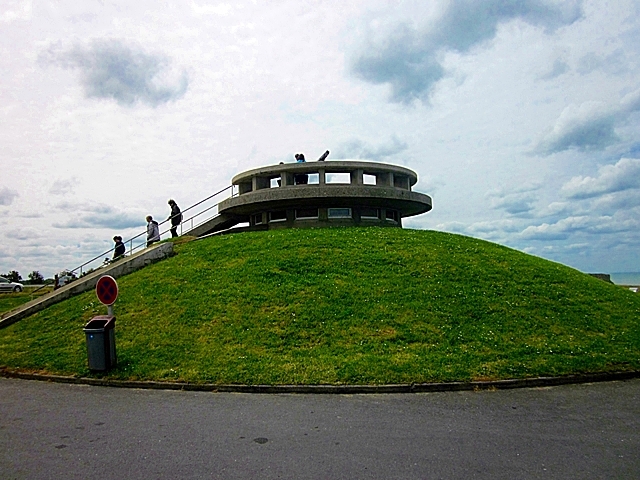 Situated in a good location for visiting all of the battle sites and War Cemeteries, there is also a museum at Arromanches with information about Operation Overlord and in particular, the Mulberry harbors. 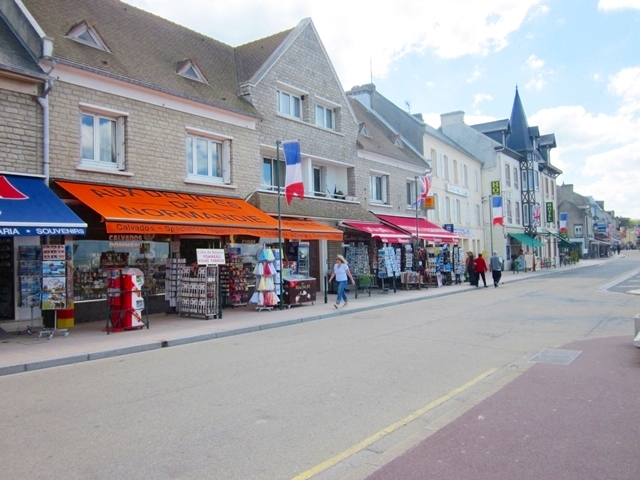 This town is in the center of the D-Day assault beaches, one of the beaches used by British troops in the Allied invasion. 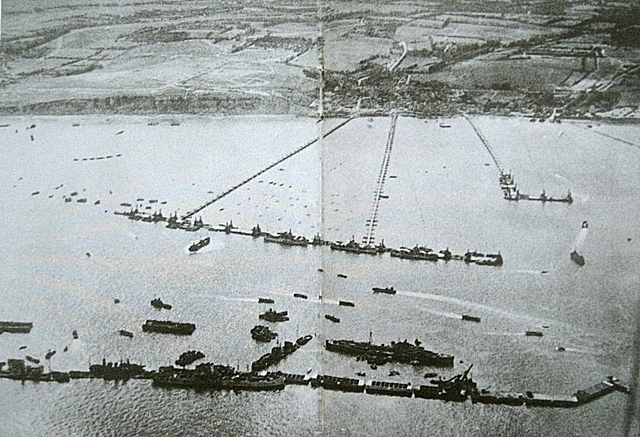 Arromanches was selected as one of the sites for two Mulberry Harbours built on the Normandy coast, the other one built further West at Omaha Beach. 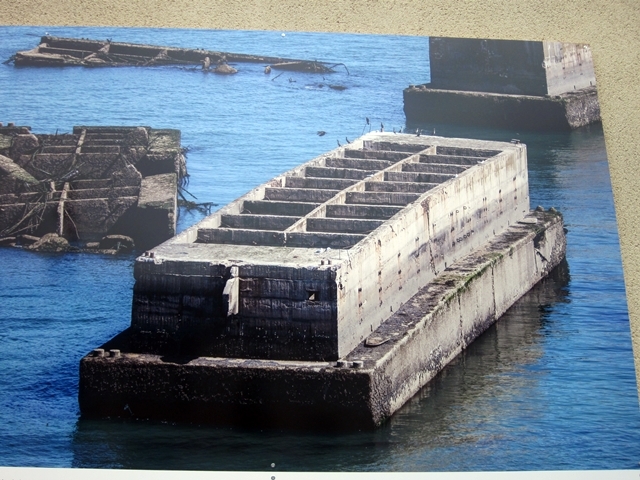 Sections of the Mulberry Harbour at Arromanches still remain today with huge concrete blocks sitting on the sand, and more can be seen further out at sea.. 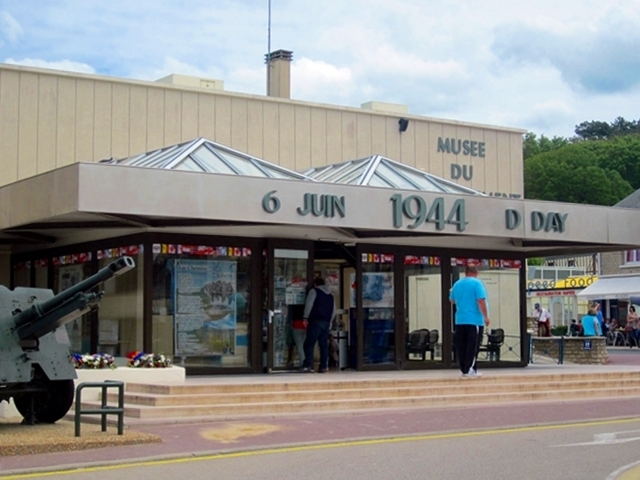 Here is the D-Day museum at Arromanches with excellent exhibits, especially regarding the “Mulberry Harbor”. 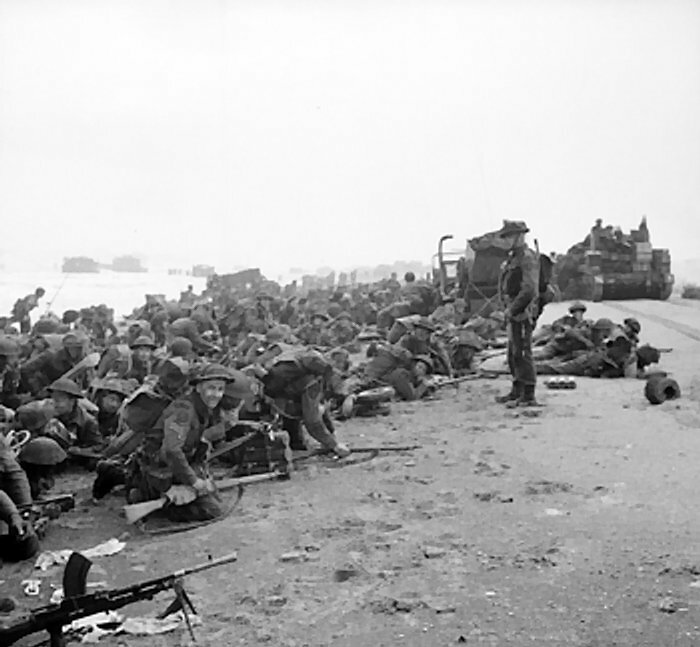 British troops coming ashore at Arromanches on D-Day. 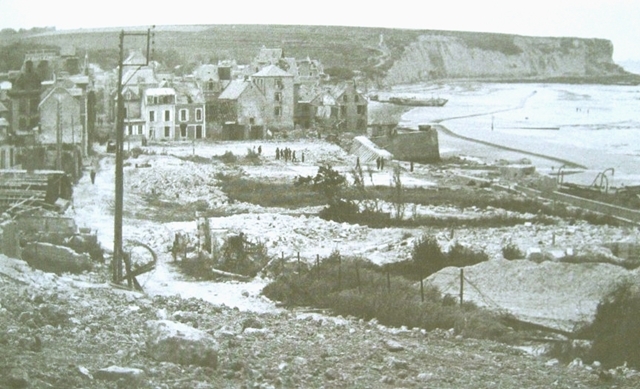 Downtown Arromanches cleared for the harbor. Here is an aerial view of the Mulberry Harbor on Gold Beach in 1944. 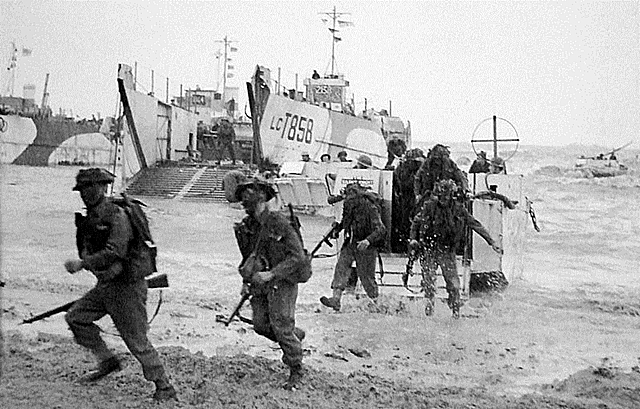 The Dieppe Raid of 1942 had shown that the Allies could not rely on being able to penetrate the Atlantic Wall to capture a port on the north French coast. The problem was that large ocean-going ships of the type needed to transport heavy and bulky cargoes and stores needed sufficient depth of water under their keels, together with dockside cranes, to off-load their cargo and this was not available except at the already heavily-defended French harbors. 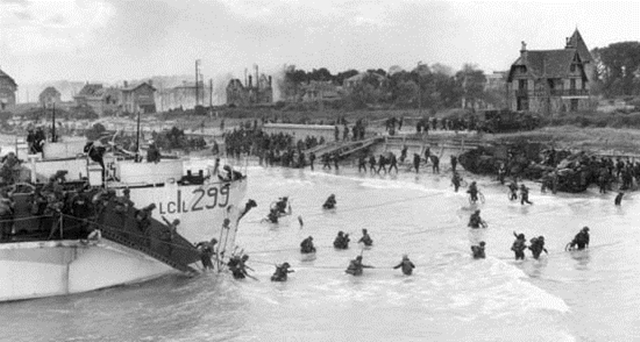 Thus, the Mulberries were created to provide the port facilities necessary to offload the thousands of men and vehicles, and tons of supplies necessary to sustain Operation Overlord and the Battle of Normandy. The harbors were made up of all the elements one would expect of any harbor: breakwater, piers, roadways etc. The harbors called for many huge caissons of various sorts to build breakwaters and piers and connecting structures to provide the roadways. They built in the UK and were towed across the English Channel by tugs to the Normandy coast at only 4.3 Knots and sunk in place. Also, dozens of ships were sunk off shore to protect the harbor from storms. The harbor was nicknamed “Port Winston”. It saw heavy use for 8 months—despite being designed to last only 3 months. In the months after D-Day, it was used to land over 2.5 million men, 500,000 vehicles, and 4 million tons of supplies providing much needed reinforcements in France. Here is one of the caissons today. 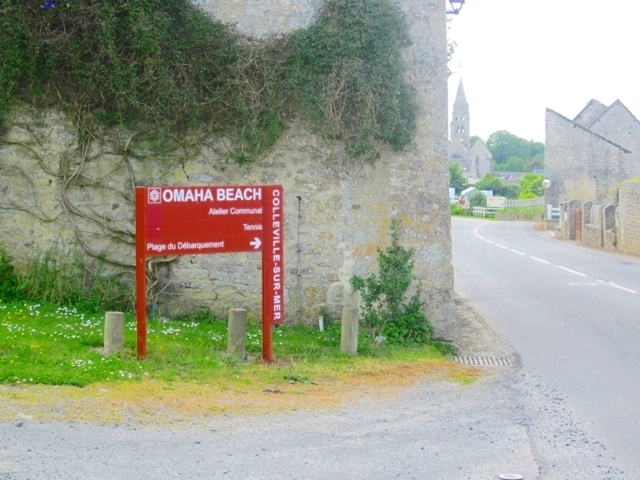 We now leave Gold beach and head to Omaha Beach passing through several quaint little Normandy farming villages.